What’s the Chinese character for “wurst”? Yet another last-minute long-distance trip, this time to Frankfurt, Germany, lets me check out United Airlines’ new business class service, and think again about the value for those expensive lie-flat seats. 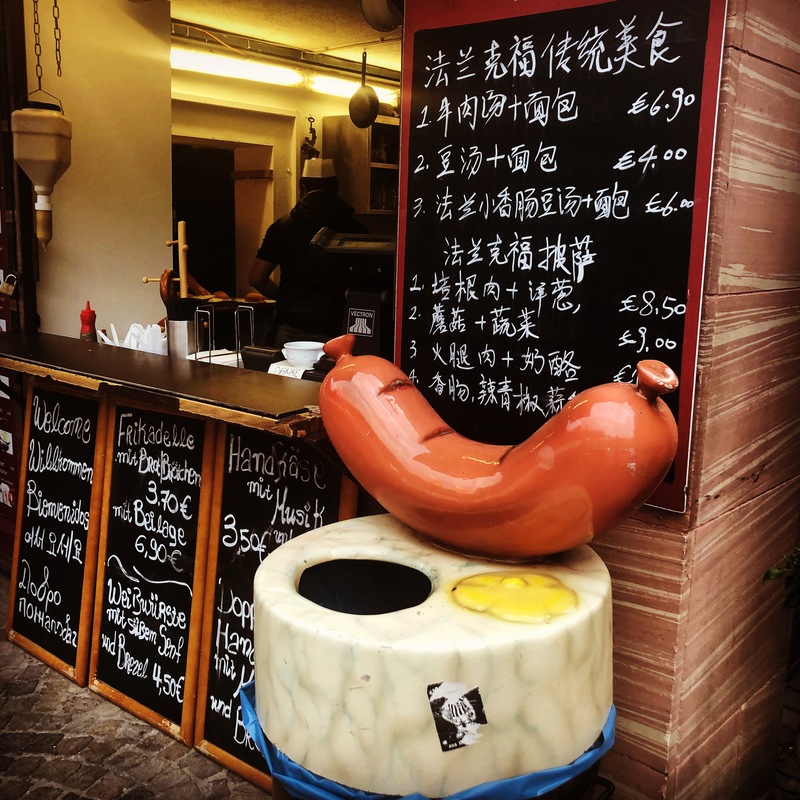 Seeing a new Chinese menu at a favorite wurst stand in the old part of Frankfurt reminds me of the changes driven by the new wave of Chinese tourists. I also read recent PR pitches for a new smart bag and a business traveler’s biohack. All this and more at the direct link to the podcast file or listening to it right here by clicking on the arrow below. Coming to you from a rather jumbled up TravelCommons studios outside of Chicago, IL. Been playing “furniture jenga” for the past couple of weeks as we do a lot of deferred maintenance before trying to relocate the studios into Chicago. The recording studio is jammed full and the regular production bay has been taken out of commission, hence me missing my usual end-of-month posting and slipping into the first week of July. June’s travel cadence was almost a complete rinse-and-repeat of May’s. A few day drives up to Wisconsin, pretty easy — until I had to make a last-minute trip to Germany with about 36-hour notice — leave Weds night, land Thurs morning, meet with the client Thursday afternoon, lead a workshop Friday, fly home Saturday morning. I booked an eye-bleedingly expensive last-minute business class ticket because I needed to work and get some sleep on the flight over, which United was kind enough to convert into a 1st-class seat on the Weds flight, giving me more than enough space to eat and work simultaneously. The bumper music is from Saurab Bhargava, a long-time listener and longer-time friend and colleague who said in a note “Took some time on the cruise to catch up on some TravelCommons podcasts. Glad you’re still keeping the rhythm on that!” I have been working to keep a regular monthly cadence. I’ve managed to keep it up for a year, which is why I’m a bit put off with myself for missing my June deadline. Though I have to tell you, the combination of a flash trip to Germany, studio reconfiguration, and the World Cup hasn’t helped — especially the World Cup. Maybe now that we’re in the knockout round, and there’s only 2 games in a day, I’ll double up on episodes in July. Being World Cup-literate was very handy while in Germany. Good for making small talk with the client, and Friday night in Frankfurt, every bar seemed to have found half-a-dozen big screens a piece and stood them up everywhere inside and outside. It was easy to keep up with the matches, even when walking down the street. And this wasn’t even for the German team; it was Nigeria-Iceland and Switzerland-Serbia — not even in Germany’s group. Good reminder of how big a deal it is outside the US. Long-time listener Geoffrey Greene pinged me on Facebook to let me know that TravelCommons is on the new Google Podcast app. I think I mentioned some time back, that I’ve been having problems with Google Play picking up TravelCommons ever since they started with podcasts. I’d filled out all the forms, submitted the RSS feed, but there was some error somewhere. Finding someone somewhere in Google support to resolve that has been on my to-do list for a while. I still need to get that sorted, but I’m glad to know the problem hasn’t carried over to the new app. I also need to update the website with links to all the places where people can subscribe to TravelCommons. Yet another line on the to-do list. Continuing the ongoing thread about smart bags… in the last episode, I talked about 2 smart bag manufacturers going out of business. But this past week, sifting through the PR pitches in the TravelCommons mail bag, I saw this — “First Smart Luggage Safe to Fly Worldwide”. Plevo — who thinks of these names? — claims to be “the first smart luggage in the world that was designed to be safe to fly around the world” with “a removable battery pack, GPS Tracking, Smart Lock, Built-in Digital Scale, distance alerts and a Travel Assistant App”. OK, this is interesting. I head over to the inevitable Kickstarter page and check out the video. Very slick, but it didn’t answer what is the key question for smart bags — how does Plevo provide location tracking and connect to the app when the battery pack is removed? Briana, the PR person, told me the Plevo bags have 2 batteries — a removable Lithium battery pack and a permanent Nickel battery that takes over when the Li battery is removed. Elegant solution. The risk, though, is when that elegance breaks down in the face of a harried gate agent that doesn’t have the time to work through the safety differences between Li and Ni batteries, and just finds it easier to say “No”. No problem getting past the UA gate agent in Frankfurt with my low-tech leather bag I bought in Italy a few years ago on our 25th anniversary. Checking my passport, she looked down — “That’s a great bag!” she said. Sometimes, simpler is better. Another PR pitch that caught my eye, but in a less positive way, was titled “A Travel Hack Every Business Traveler Should Know About”. I don’t know about you, but I’m pretty much done with growth hackers and lifehackers and especially travel hackers. I’m old enough to remember when a hack was an ugly bit of code that managed to get a system running, but it wasn’t something that anyone was proud of. But I digress. I was killing time in United’s very nice new ORD Polaris business class lounge waiting for my Frankfurt flight, so I took the bail and opened it up. “With more executives turning to food as a biohack,” I’m regretting this click already, “an airport meal that fits with your food lifestyle can be hard to find.” The pitch was for Ample, a powdered, rehydrateable drinkable meal that’s TSA-compliant and “packed with on-trend ingredients like MCTs from coconut oil, fiber, probiotics, micronutrients from chlorella, and protein from grass-fed whey and collagen.” MCT’s, a Google search tells me, are medium-chain triglycerides that are good for you in a whole bunch of ways, I guess. Ample reduces decision fatigue — “Just like Zuck never needs to decide what to wear, deciding what to eat at an airport is a piece of decision fatigue that you just don’t need” and makes it easier to follow “a ketogenic lifestyle”. Feeling the onset of buzzword fatigue, I set my phone down, walked over to the bar, abandoned any hope of achieving ketosis, and pointed to the Revolution Brewing Anti-Hero IPA draft handle. I didn’t mention this in the last episode, but before I headed out on my India trip, I hit the AT&T website to see if India is included in their international plan (it is) and to get one of their international data packages since I wasn’t going to have time to figure out the local SIM market. I was pleasantly surprised to find that the data limit of their base $60 offering has been bumped from 300MB to 1GB sometime in the last 2 years, and way up from 100MB back in 2011. The last time I used AT&T’s international plan was March 2016 during a 4-day trip in Iceland. I turned cellular access off on just about every app except Google Maps and only just squeaked through without topping the 300MB limit. 1GB is a whole lot roomier. I had no problems in India. I don’t know when that limit got bumped up, but good on AT&T for making that base plan much more realistic. This is about the time when I have the obligatory craft beer comment, and you’d think that coming off a trip to Germany, I’d be full of them. And at the end of the day on Thursday, after taking a 20-minute nap to catch my second or third wind, I headed out looking exactly for that — a bierstube with some local beers and maybe a wurst platter. Walking around near the hotel, there wasn’t much — it was kind of a dead plaza with some pizza and doner kebab places. One nice restaurant, but nothing special. I pulled out Google Maps and started scrolling around, zooming in and out looking for some beer places. I don’t see many of those, but I keep seeing wineries pop up south of me. So I start walking. 15 minutes, I hit one of the wineries and walk in. What’s with all the wineries, I ask? “You’re in one of the largest wine producing regions in Germany,” the guy nicely explained. “I’m getting ready for a big wine dinner right now, but stop in tomorrow if you want to taste our wines.” I’d be leaving for Frankfurt tomorrow, but I thanked him. So now, I’m looking for wine. It was after 5, and all the other wineries I passed looked closed, but I found a restaurant with what looked like a good local wine list and a nice courtyard. The waitress made some recommendations — “This is a nice wine from our next door neighbor” We struggled a little bit figuring out the translation for the daily special on the chalkboard, but with dueling smartphone searches, we figured it out — it was a local dish of spit-roasted pork. It was a nice surprise; a nice ending to the first day of what I thought was going to be just a Bataan death march of a trip. Which it would’ve been if I’d stayed in my hotel room rehydrating my third bottle of Ample ketogenic liquid so I could slog through another 50 emails on my way to zero inbox nirvana. The trips to India and Germany put me back in international business class for the first time in a while. In past episodes, I’ve been ambivalent about the value for money for business class — is the extra space and the better meal service worth the $5-6,000 uplift? On these trips, I kinda think “Yes” because neither trip had any slack in the schedule — I’d be landing and going directly into meetings, so those lie-flat business class seats were what I really needed so I could get some amount of quality sleep. Walking on the United Triple 7 though, you could feel United packing as much as they could in that business class with a 2-4-2 seat configuration — only just slightly less packed than the 3-4-3 seating on the other side of the curtain in Economy. I’d never seen two middle seats in business class before. Business class in the Lufthansa A380s between Frankfurt and India were 2-2-2 — no middle seats. Now on my flight over in May, I had the aisle and a couple had the middle two seats, so not too bad, and they were good folks. I felt bad for the husband during the night, though, when I had my seat in full lie-flat mode. When he needed to hit the toilet at night, he had to kinda vault me. On my last flight back from Frankfurt, a good-sized guy had the middle seat next to me. I’d guess he was a former football player, still in good shape, but taller and broader than the average build that United had sized these Polaris pods for. He said that the flight over, he couldn’t lay flat; it felt like a coffin, so he just reclined it and catnapped, which kinda defeated the purpose of hitting the ground running. I could sympathize. I’m not that broad, but I had to drop the aisle-side armrest in my pod to be able to comfortably fit. Kinda nice service, but definitely snug. The Lufthansa business class lounges lacked the pizzazz of United’s lounges. But one thing that was new to me… the flights to India went out of a different concourse in Frankfurt — on the last episode, I talked about the mile-&-a-half walk and the extra security — and here, they boarded the A380 first and business classes straight from the lounge. No walking down to the gate and idling around with the economy classes. They had gate agents and kiosks in the club. I set down my beer, had my boarding pass scanned, and then walked down the jetway to the plane. Once on-board, Lufthansa’s A380s were definitely roomier than United’s Triple 7’s — maybe a bigger plane, maybe because they weren’t trying to cram 8 people across. With only 6 people across, the lie-flat seats were more comfortable, not as “coffin-ish” as United’s. Indeed, maybe a little too comfortable. A guy in the row behind me on my flight to Delhi must’ve gone deep in sleep because he snored — loudly, really sawing wood — for a couple of hours. The one time I wouldn’t have minded a little turbulence to jostle the plane. But good for him, he was definitely getting his money’s worth from Business Class. The last night I was in Germany, Friday night, I stayed in Frankfurt so I’d have just a 20-minute cab ride to the airport for my 8:15am flight. It had been 7 years since I’d walked around the city — back in 2011 when I did a TravelCommons video, retracing the “1 City, 5 Hours” article about Frankfurt in United’s seatback magazine. I walked down to the Romer area – a big open square surrounded by historic buildings — and over to a sausage, a wurst stand that I’d eaten at in the past. They’d added a new menu — the German menu was now on the ground, under the ordering window; the new menu at eye level was in Chinese. The travel press has been talking about the impending growth of Chinese tourism for a bit now. I’ve seen the tour buses full of Chinese travelers for some time — back in 2016 when my son and I were in Iceland, it became a bit of a game for us to stay ahead of those buses, and then in Frankfurt, down in a basement applewine pub off some back alley, I was the only non-Asian person there. But now, I’m noticing more, I dunno, systemic or infrastructure changes being driven by Chinese tourism. Not just Chinese menus but also seeing restaurants in the US and Europe accepting Chinese mobile payments – WeChat and Alipay. And some folks in the hotel business will say that the push to provide free wi-fi, mobile apps and family-sized rooms is driven, in some ways, by what Chinese tourists are looking for. Makes sense. Last year, there were 130 million outbound Chinese tourists, a big number but only 10% of the population of China. There’s a lot more to come. Bridge music from from Saurab Bhargava’s album Chromatique. The tracks were Exit, Yours In Mine, and Through The Line. Here’s an Amazon link where you can buy the album.